Last Saturday, a group of over two dozen area women donned wedding gowns to raise money for a good cause. The fundraiser, “She Said Yes to the Dress,” was coordinated by Epsilon Sigma Alpha (ESA) was held at Trinity Lutheran Church in Vermillion. 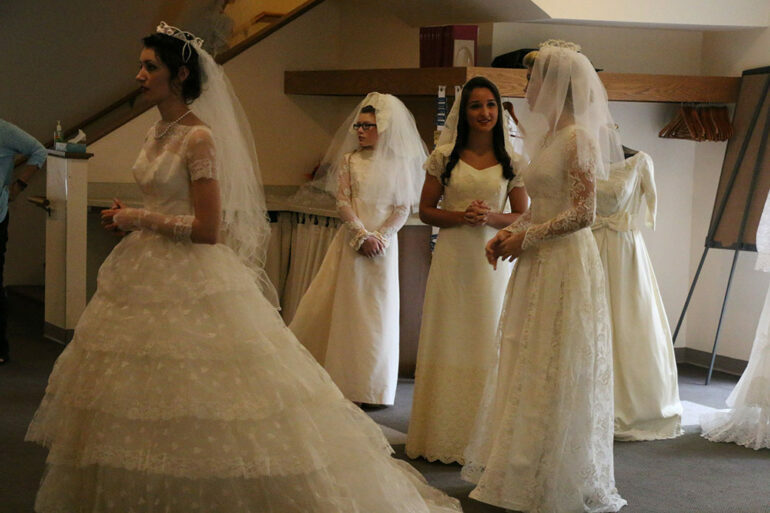 “She Said Yes to the Dress” was a fashion show featuring wedding gown styles from the 1940s to the present day. Trudy Zalud, a member of Theta Omega, the Vermillion chapter of ESA, said cancer fundraising has a wide base of support in any community. “This is a cause that everybody can get behind because who among us hasn’t been impacted by cancer?” Zalud said. “She Said Yes to the Dress” funds were used to support the American Cancer Society’s Relay for Life. The organization cooperated with Colleges Against Cancer for the fundraiser. Zalud came up with the idea for the event last year. She added that it worked well to combine wedding-themed fun and a good cause that everybody can get behind. “Everybody loves weddings,” Zalud said. Most of the dresses for the show this year had an association with Vermillion or Yankton. This year, two dresses with celebrity origins – one which belonged to acclaimed soprano and USD grad Carla Connors, and another that was worn by Linda Daugaard, wife of South Dakota governor Dennis Daugaard. “We were very lucky that they believed in us and were generous enough to share their special dresses with us,” said Zalud. In all, 27 dresses were modeled in the show — 20 bridal gowns and seven attendants’ gowns. Taylor Hackett, a senior at USD majoring in communication sciences and disorders and president of Colleges Against Cancer, was one of the models for the show. Zalud called Hackett a “Godsend with this whole show,” because of all the work Hackett did. Carlson modeled a dress from 1947, the oldest in the show. This is the second year that ESA and Colleges Against Cancer have done this fundraiser, and they plan on continuing it. “I’d be surprised if we didn’t because I think there would be a riot if we didn’t,” said Zalud. In fact, Zalud said that they already have 33 dresses ready to be modeled in next year’s show. Funds raised at the event will support next February’s Relay for Life that Colleges Against Cancer is organizing.